Posted on October 21, 2017 January 8, 2019 , in Swim Spas. Living with the symptoms of arthritis is a challenging and painful condition. Owning a swim spa is an excellent way for individuals that suffer from arthritis to remain active and flexible. In this article, we will discuss a few of the ways that swim spas can help reduce the severity of arthritis and the frequency of flare-ups. Swim spas are a fantastic choice for individuals that have not been able to exercise regularly due to immobility and pain from arthritis. Exercises such as using low-impact swim spa weights, resistance bands and deep stride walking help to improve muscle flexibility, core strength, and tone. In a swim spa, exercise can be performed without putting unnecessary strain on joints. An added benefit is that swimming against the swim spa current helps improve breathing, which helps your cardiovascular system function better. 1. Stand in the swim spa current upright with your shoulders back and chest lifted. While keeping your arms slightly bent to the side, slowly take a stride. Your heel should come down first, then the ball of your foot until your entire foot rests flat on the floor. 2. Begin by taking several steps forward as if walking on the ground. Alternate between walking sideways and backward until you are in the position that you started in and repeat. When exercising in a swim spa, always remember to remain hydrated and have a water bottle within reach. Often, people do not enjoy swimming as an exercise because of having to do laps and frequently turn around. With a swim spa, users can swim in a continuous motion against a current and set the levels to make the workout as challenging as needed. Just being in the water of a swim spa will improve the body’s circulation and blood flow, which helps to reduce and minimize arthritic pain. Over time, joints suffer from regular wear and tear and just relaxing in the warm water of a swim spa helps relieve muscles of tension and eases stress on the joints. The ambient water temperature combined with the therapeutic massage jets of a swim spa, gently massage and relax muscles which helps reduce pain. In addition to circulation, the relaxing flow of water helps to stimulate the lymphatic system – an essential tool on our body that assists in natural detoxification and waste elimination. For most arthritis sufferers, bearing weight on hips, ankles, and knees for extended periods of time can worsen symptoms. With many other forms of exercise, there is a high impact level to the joints. When in a swim spa, the water’s buoyancy reduces the weight load and impact on joints, while still providing an effective workout. When in the water, your body does not bear weight and water provides 12 times the resistance of air, making it an optimal choice to strengthen and build muscle. 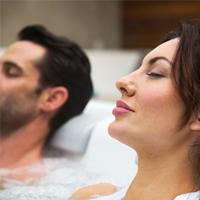 To learn more about the many other benefits that swim spas offer and how they can help with your overall health and wellness, click here to download a swim spa buyer’s guide.